Recent therapeutic innovations have marked a shift from conventional cancer management. As part of these strides, cancer immunotherapy emerged thanks to a dramatic growth in our understanding of the immune system, malignant transformation, and the tumor microenvironment. Within the field of cancer immunotherapy, a relatively novel strategy, the use of multifunctional fusion proteins or protein complexes, seeks to derive benefits from simultaneously engaging multiple proteins or signaling pathways toward more effectively blocking immune suppression and activating anticancer responses. “For the last decade, we have been working on fusion-based bifunctional proteins in cancer immunotherapy,” says Yanzhang Wei, Ph.D., professor of biological sciences at Clemson University. In the first construct Dr. Wei and colleagues generated, they fused the extracellular domain of the tumor stress protein MULT1 to the transmembrane and intracellular domain of the death receptor Fas. “The hope was that when this fusion protein was placed into cancer cells, MULT1, which is a stress protein, would bind to an NK cell activator called NKG2D, and simultaneously engage and activate NK cells,” notes Dr. Wei. The engagement of NK cells by this bifunctional protein sent an apoptotic signal to the tumor cells and enhanced their killing. Cancer cells expressing this fusion construct proliferated more slowly, and when packaged into an adenoviral delivery vector, the chimera significantly delayed tumor growth in mice. Subsequently, another fusion protein that Dr. Wei and colleagues generated combined the MULT1 extracellular domain with the mouse IL-12, to deliver the cytokine into NK cells and enhance their cytotoxicity. “The overall goal, by making these bifunctional fusion proteins, was to hopefully make the immune system a little bit stronger than the tumor cells,” points out Dr. Wei. NK cells are critical in monitoring tumor development because of their multiple surface receptors, some inhibitory and others activatory. Whether a cell will be activated or inhibited depends on the balance between the two types of signals. The NKG2D receptor and its ligands, NKG2DLs, are critical for cancer immune surveillance, and the generation of multifunctional fusion proteins based on these interactions has become a very active research area. While NK cells are important in the early stages of immune surveillance, the challenges are when a tumor cell escapes this process, accumulates more mutations, and stops producing the stress proteins. Dr. Wei’s lab is currently interested in finding ways to place several of these bifunctional proteins into cells together to simultaneously engage different cellular pathways. “But it is very challenging to simultaneously deliver multiple fusion protein gene products into tumor cells,” states Dr. Wei. “The major initial advancement was the realization that IL-15 is a heterodimeric complex naturally,” declares George N. Pavlakis, M.D., Ph.D., chief of the human retrovirus section, vaccine branch, at the Center for Cancer Research of the National Cancer Institute (NCI). At that time, members of the IL-12 family, including IL-12, IL-23, and IL-27, were known to be heterodimeric cytokines linked by disulfide bonds. “What was not appreciated was that, although in heterodimeric IL-15 the two subunits are not linked by disulfide bonds, the affinity of those subunits for each other is so strong that it brings it pretty close to a disulfide bond covalently linked molecule,” says Dr. Pavlakis. The production of stable IL-15 in cells requires the coordinate expression of the two subunits, IL-15 and IL-15 receptor alpha polypeptides. If the heterodimeric form of the cytokine is not generated, the individual subunits are to a great extent targeted for destruction by the cellular quality control systems. “This is why early efforts to produce IL-15 did not generate satisfactory yields in mammalian cells, because people were only producing half the protein, which was destroyed intracellularly,” explains Dr. Pavlakis. After scaling up heterodimeric IL-15 production, investigators in Dr. Pavlakis’ lab revealed that the cytokine delays tumors in mice. “On the basis of this work, we initiated a collaboration with Thomas A. Waldmann, M.D. [co-chief, lymphoid malignancies branch, NCI], and Kevin C. Conlon, M.D. [associate research physician, lymphoid malignances branch, NCI], and heterodimeric IL-15 is now in clinical trials for cancer immunotherapy,” says Dr. Pavlakis. Clinical trials with heterodimeric IL-15 are now being continued by Novartis. This work illustrates the critical role of interdisciplinarity in advancing basic research and in translating the findings to clinical applications. “We faced a lot of skepticism. People did not believe that a noncovalently linked heterodimer is stable, and we had a difficult time convincing the scientific community that these complexes could be developed as a drug,” recalls Dr. Pavlakis. The work by Dr. Pavlakis and colleagues also catalyzed a recent correction in immunology texts, where the prevailing idea until recently has been that free IL-15 binds to the IL-15 receptor alpha to initiate signaling. “There is no IL-15 receptor alpha. This protein does not have a receptor function, but it is the misnamed other half of the heterodimeric IL-15 cytokine, and this correction also led to practical applications in clinical development,” states Dr. Pavlakis. “When we linked IL-2 to the IL-2 receptor beta, we had in mind many problems that scientists encountered in the past when they were trying to activate immune cells,” says Youssef Jounaidi, Ph.D., instructor of anesthesia at Harvard Medical School. The ability of IL-2 to enhance the antitumor and antiviral effects of NK cells and T cells was reported years ago, and clinical trials subsequently exploited this finding. “But the excitement was short-lived, and one of the reasons was that high-dose IL-2 causes several side effects, such as pulmonary edema,” explains Dr. Jounaidi. IL-2 signaling is mediated through a multisubunit receptor complex that contains alpha, beta, and gamma subunits. IL-2 binds with low affinity to the IL-2 receptor alpha, and with intermediate affinity to the IL-2 receptor beta complexed with the gamma chain. NK cells are relatively insensitive to low IL-2 levels. However, regulatory T cells have high receptor-alpha levels and outcompete other immune cells for IL-2, which opens another challenge in using IL-2 to modulate the immune response. National Cancer Institute researchers led by George N. Pavlakis, M.D., Ph.D., have been developing heterodimeric IL-15 (hetIL-15) as an immuno-oncologic drug. The images show the accumulation of granzyme B–positive cytotoxic T cells in lymph node follicles after hetIL-15 treatment. 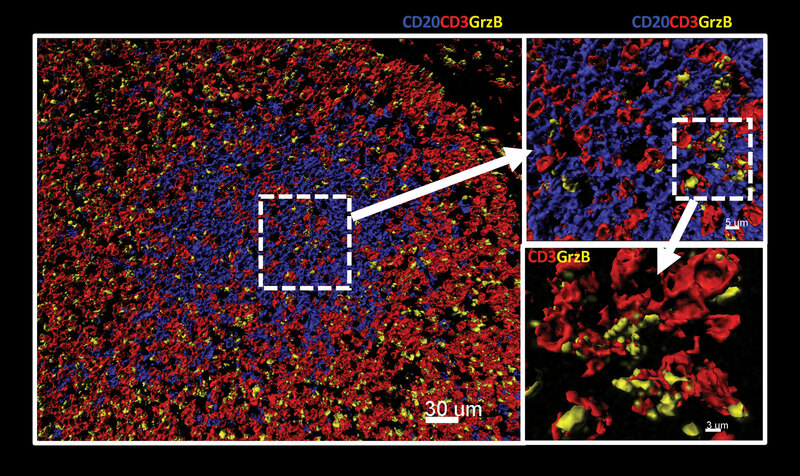 Staining: CD20+ (B cells, blue); CD3+ (T cells, red); and GrzB+ (T cells, yellow). Photo credits: Moysi, Petrovas, and Pavlakis, NIH, 2018. A new approach developed by Dr. Jounaidi and colleagues involves tethering IL-2 to the IL-2 receptor beta using a peptide linker. The newly generated fusion protein was used to genetically modify NK cells to induce IL-2 expression. Activated immune cells expressing this construct expanded indefinitely in a feedback loop, without the need for exogenous IL-2. In vitro, immune cells expressing this chimeric protein showed cytotoxicity comparable to or higher than wild-type IL-2. The construct also led to better anticancer effects and superior survival in mouse models. “The idea of arming tumor cells with IL-2 to survive in the tumor microenvironment is not new. Investigators just did not have the means to do it efficiently, and we believe that our chimera will help immune cells better survive in the highly immunosuppressive tumor microenvironment,” states Dr. Jounaidi. A small subset of NK cells are able to lyse multiple target cells in a consecutive fashion, elicit faster and stronger lytic responses, and replenish their cytokine stores. These cells have become known as serial killers. “NK cells that expressed our chimeric protein showed an increase in lytic enzymes upon contact with cancer cells,” reports Dr. Jounaidi. The chimeric construct also conferred resilience to TGF-beta1, which is secreted by cancer-associated fibroblasts and other cells in the tumor microenvironment and inhibits the anticancer responses of immune cells. “One strategy to fight cancer is to arm cancer-fighting immune cells with an additional mechanism to resist immunosuppression in the tumor microenvironment, and tethering IL-2 to its receptor beta would solve this problem,” asserts Dr. Jounaidi. “Our findings provide insight into the structure-function relationships in the 4-1BB/4-1BBL system and, in the broader context, help us better understand the TNF/TNF receptor superfamily,” says Manuel Baca, Ph.D., formerly at MedImmune, where this work was done, and now the director of biologics discovery at Gilead Sciences. 4-1BB, a costimulatory receptor of the TNF superfamily expressed on activated immune cells, has attracted considerable interest as a target for cancer immunotherapy. “The modality of therapeutics relevant to this category of targets has been to generate agonists to activate this receptor,” notes Dr. Baca. Targeting 4-1BB with agonistic antibodies has demonstrated potent antitumor effects in murine tumor models, making this a promising approach for treating cancer through stimulation of the immune system. “Finding an antibody that acts as an agonist is much more difficult than finding one that can block the interaction with a natural ligand,” continues Dr. Baca. Two 4-1BB agonistic antibodies are currently in the clinic, and while one of these is a much better agonist than the other, it also causes toxicity that is likely related to its potent activation of 4-1BB. This has created ongoing interest in developing new therapeutic agonists that have activity that is selective and sufficient to elicit a therapeutic effect while avoiding any on-target toxicity. “Solving this structure was driven by us wanting to understand how the natural ligand (4-1BBL) is able to activate 4-1BB, particularly since a previous structure of 4-1BBL suggested it did not adopt the same shape as other TNF family ligands,” says Dr. Baca. The crystal structure of the ligand-receptor complex that Dr. Baca and colleagues solved showed that 4-1BBL formed a canonical bell-shaped trimer, which is typical of TNF superfamily member ligands, and also revealed the precise details of how the ligand engages three copies of the receptor, a necessary prerequisite for activation of 4-1BB signaling. “The more we understand the natural receptor-ligand complex and how it might signal, the better we can guide the design of therapeutic agonists, be they agonistic antibodies or other molecules that mimic the activity of the natural ligand,” states Dr. Baca. T cells made with messenger RNA (mRNA)-encoding chimeric antigen receptors (CAR) offer a safe alternative to those transduced with viral CARs by mitigating the side effects of constitutively active T cells. Previous studies have shown that mRNA CAR T cells are transiently effective, but lack persistence and potency across tumor types. Foster et al. hypothesized that the efficacy of mRNA CARs could be improved by utilizing recent advancements in RNA technology, such as incorporating a modified nucleoside, 1-methylpseudouridine, into the mRNA and applying a novel purification method using RNase III to eliminate dsRNA contaminants. In an article entitled “Purification of mRNA encoding chimeric antigen receptor is critical for generation of robust T cell response,” which appears online in Human Gene Therapy (www.liebertpub.com/doi/10.1089/hum.2018.145), published by Mary Ann Liebert, Inc., T cells electroporated with nucleoside-modified and purified mRNA encoding CD19 CAR showed an initial twofold increase in CAR surface expression, as well as a twofold improvement in cytotoxic killing of leukemia cells that persisted up to five days. T cells generated with nucleoside-modified and purified CAR mRNA also showed reduced expression of checkpoint regulators and a differential pattern of genetic activation compared to those made with conventional mRNA. In vivo studies using a leukemia mouse model revealed that the most robust 100-fold suppression of leukemic burden was achieved using T cells electroporated with purified mRNAs regardless of their nucleoside modification. 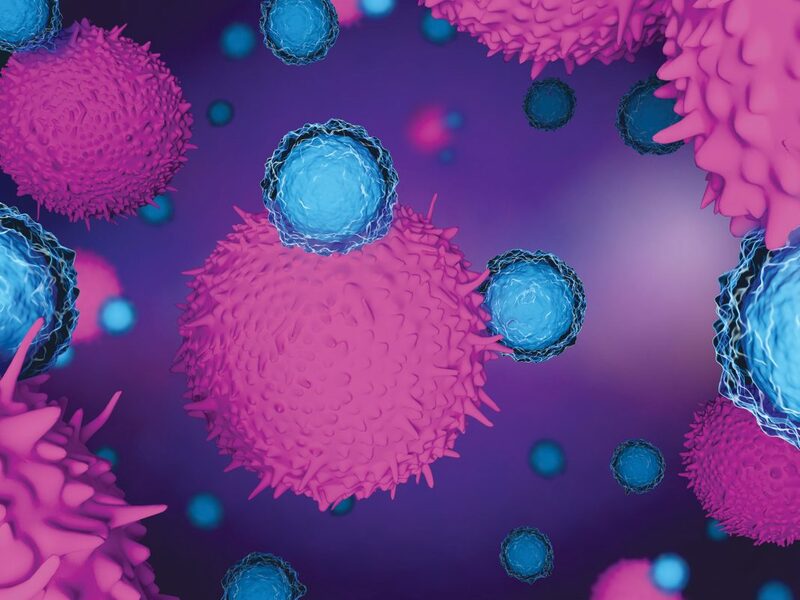 “Our results provide a novel approach to generate mRNA for clinical trials, and poise mRNA CAR T cells for increased efficacy during testing as new CAR targets emerge,” write the investigators.